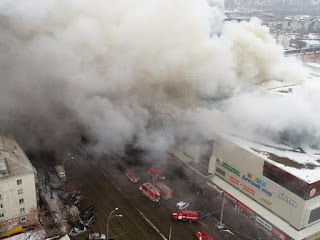 At least 64 people have died, including many children, and more than fifty people have been injured and affected with smoke inhalation in a virulent fire unleashed on Sunday at Zímniaya Vishnia (Winter Cherry), shopping center located in the Russian city of Kemerovo. "At this moment the death of 64 people has been confirmed," Svetlana Petrenko, the spokeswoman for the Russian Committee of Instruction, told reporters early on Monday. Nine people intoxicated with carbon monoxide are admitted to the toxicological services, their life is not in danger, according to Russian Health Minister Veronika Skvortsova. The survivors are in a serious emotional state due to the death of their relatives and the psychologists are working with them, he added. To identify the dead in the fire in Kemerovo will be necessary to go to DNA tests, said the minister, whose words collected RIA Novosti. Authorities in the province of Kemerovo will declare three days of mourning for those killed in the fire as of Tuesday. 841 people and almost 200 units of machinery are participating in the extinction of the fire and the consequences of the fire in Kemerovo. The Russian Emergency Ministry in the Kemerovo region has confirmed that 100 people have been evacuated and 20 saved, although the Interfax source in the emergency services increases the number of evacuees to about 250 people. In general, those affected have symptoms of poisoning by products of combustion, while two of them were injured by falling from height, report the health authorities. The residents of Kemerovo have dedicated themselves to the donation of blood for the survivors of the fire in the shopping mall. Rescue works are hampered by the danger of collapse in some buildings. It is reported that an 11-year-old girl, family member of the governor of the Kemerovo province, Aman Tueyeyev, lost her life in the fire. "The situation in the extinction of the fire becomes drastically dangerous, instability was detected in the vertical constructions, there are movements in the roofs", said the Russian Minister of Emergency Situations, Vladimir Puchkov. The Investigative Committee of Russia has opened a criminal case after the fire of the Russian mall. Researchers have already begun to review the recordings of the surveillance cameras. Police have detained and interrogated four people in the framework of the investigation of the fire, including the owner of the center and the director responsible for fire safety. Preliminary data suggest that the focus of the fire was on the upper floor of the mall, where the movie theaters and children's amusement spaces are located. All the bodies of the 37 deceased have been found on the fourth floor of the shopping center, reports the crisis management center. According to preliminary data, the fire alarm was not activated in the building, so the people who were in it noticed the fire only when dense smoke flooded the center.